To investigate the association between intake of flaxseed—the richest source of dietary lignans (a class of phytoestrogens)—and breast cancer risk. A food frequency questionnaire was used to measure the consumption of flaxseed and flax bread by 2,999 women with breast cancer and 3,370 healthy control women who participated in the Ontario Women’s Diet and Health Study (2002–2003). Logistic regression was used to investigate associations between consumption of flaxseed and flax bread and breast cancer risk. Confounding by established and suspected breast cancer risk factors, as well as dietary factors, was assessed. Flaxseed or flax bread was consumed at least weekly by 21 % of control women. None of the 19 variables assessed were identified as confounders of the associations between flaxseed or flax bread and breast cancer risk. 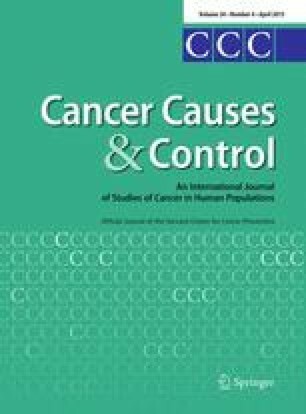 Consumption of flaxseed was associated with a significant reduction in breast cancer risk (odds ratio (OR) = 0.82, 95 % confidence interval (CI) 0.69–0.97), as was consumption of flax bread (OR = 0.77, 95 % CI 0.67–0.89). This Canadian study is, to our knowledge, the first to report on the association between flaxseed alone and breast cancer risk and has found that flaxseed intake is associated with a reduction in breast cancer risk. As dietary intake of flaxseed is modifiable, this finding may be of public health importance with respect to breast cancer prevention. This work was supported by the Canadian Breast Cancer Research Alliance with special funding support of the Canadian Breast Cancer Foundation Ontario Chapter [Grant number 13572 (to MC)].